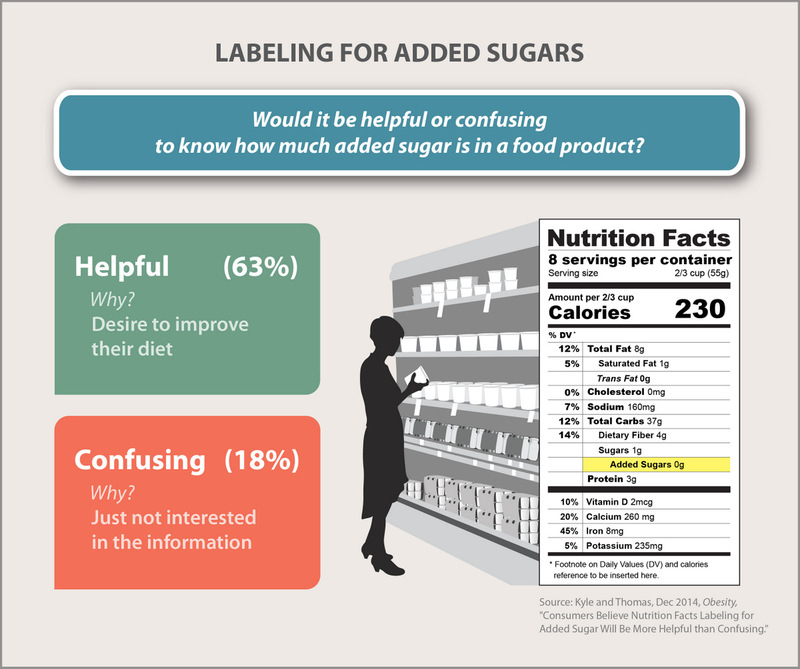 New research published today in the journal Obesity finds that consumers believe — by a wide margin — that information about added sugars on Nutrition Facts food labels will be more helpful than confusing. The FDA proposal to require this information has attracted 287,874 public comments and intense opposition from some elements of the food industry. One of the arguments against disclosing added sugars on food labels is that the information will be confusing. The new research seems to undercut that argument. The Obesity Society and a host of other health organizations are on record supporting this, along with other changes FDA has proposed to the Nutrition Facts panel on food products. Added sugars represent 16% of Americans’ total reported energy intake. The American Heart Association recommends limiting added sugars to less than half the discretionary calorie allowance, which means Americans are consuming anywhere from about twice as much added sugars as recommended (men) to three times as much (women). Under current labeling practices, determining how much added sugar one is consuming can be difficult or impossible. Added sugars may appear in ingredient lists under many different names, some not immediately identifiable as sources of sugar. The FDA has proposed disclosing the amount of added sugars as part of its revision to the Nutrition Label, the first such revision since 1993. Studies have found that consumers tend to look closely on labels for nutrients they wish to avoid and that information on labels can influence behavior . The belief that this information would be helpful was consistent across almost all demographic groups analyzed. The only demographic variable of any significance was gender: women were more likely to indicate the information would be helpful. Click here to read the study, here to read more from ConscienHealth, and here to read comments by the Obesity Society supporting proposed changes to the Nutrition Facts label. “Duh” is right!!! 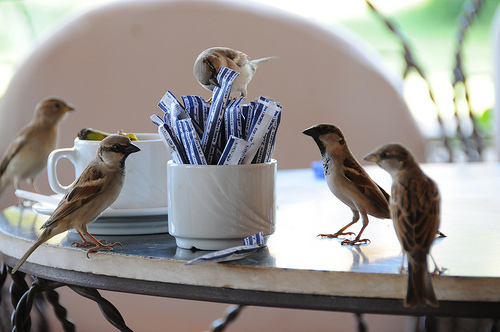 Why is it taking so interminably long to get added sugars on the Nutrition Facts label! Not much difference here in Cuenca, EC, they have Red (alta – high), Yellow (medio – medium) and Green (bajo) labels on processed foods…for example, Alta – en azucar – high in sugar; Medio – en sal – medium in salt, and Bajo – en grasa. For bottled sodas and “sports drinks” it’s as usual. For example, I’m looking at a small bottle of Gatorade – it says it contains 473 ml – about 16 oz – and the label reads 14 g of azucar per serving – well – at least the info is there – they consider this 2 servings! that’s on the “Informacion Nutricional” label – also labeled “Medio – en azucar y Bajo en sal – no contiente GRASA”. good thing that a bottled drink doesn’t contain fat. No way this can be considered “low in sugar” – because no one drinks half the bottle, right? 24 grams of sugar – 6 teaspoons, 16 oz, first ingredient agua, second and third ingredients, azucar y dextrosa. SOS DD. I agree it should happen as quickly as possible, Susan. Some legitimate resistance has to do with the logistical challenges for implementing this change. I totally respect the need to make these changes in an orderly, efficient manner. But the loudest protests come from companies that have loaded up their products with added sugar and hidden it under many layers of euphemistic ingredient lists. Those protests deserve no respect.